I provide here a PDF version of the spreadsheet I keep of all the slides in my aphid collection. This might be useful to other aphid specialists interested in whether I might have found certain rare species, or with an eye toward borrowing material, or perhaps studying the known ranges of species they are interested in. Regarding the latter, for example, I know for a fact that my field work has substantially expanded the known geographical and host ranges of several species. If you want to borrow material, I am open to requests, within reason. One thing I definitely welcome is exchange of specimens. If I have something of interest to you, perhaps you can find something of interest to me and we can exchange. The January 2019 release of my slide collection database reflects all 10,850 slide records in my collection. During winter of 2018 I did quite a bit of collection curation, adding, deleting, or changing species names on many slides. I also found large swaths of the spreadsheet that I had not been keeping up-to-date — these areas were updated. In August 2018: I re-counted the number of identified species in the collection, and arrived at 598, now updated to 608 (as of early January 2019). During winter of 2019 I have changed some host plant records to reflect my gradually improving plant taxonomy knowledge. The way this website works, old links will link to the old database. To make the new database active, you must use the link I provide below. Or, better yet, simply link to this page. 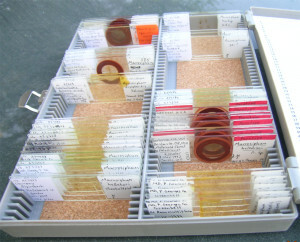 Some of the Macrosiphum slides. Species identifications were completed to the best of my ability at the time I processed the sample and filed the slides in the collection, or when I subsequently conducted collection curation activities during the winter. Some identifications were inadequately informed and quite probably wrong. On the other hand, there are some groups that I do not assign species names to, such as some Nasonovia (Kakimia), Hyperomyzus (Neonasonovia), Obtusicauda, Ericaphis, etc. ; I do this because I think the species-level taxonomy is inadequate and that therefore a species name on a slide means little. If you find a long list of specimens in my collection without species names it is usually because of this issue, or because I know with some confidence that I have an un-described species. You may notice that in the host plant column I often have only plant genus listed. This is simply because my plant taxonomy skills are strong at the family and genus level, but I lack the time (or staff) and resources to get species identifications on my host plants (remember, this is my hobby). I do not use GPS coordinates when I collect. I tried this for a while, and found it time consuming, then I left my GPS on the top of my car once and drove off. It was crushed on the highway. Also, because I make all my own slides with limited equipment, I hand-write my labels and would rather not write GPS coordinates on them all! My collection is old-school. 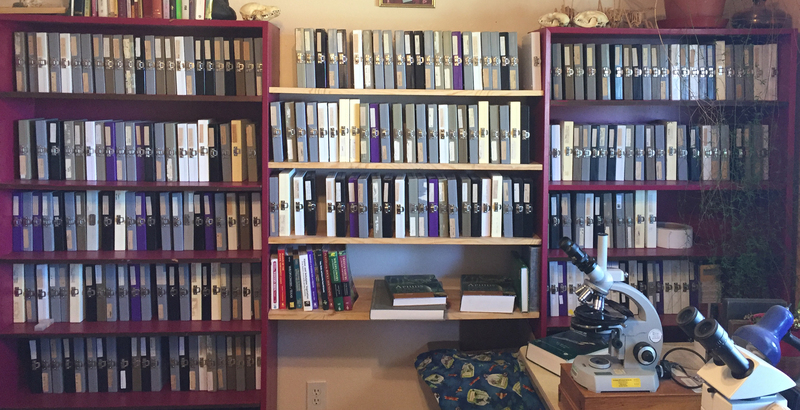 The whole collection as of April 2018 (10 more boxes added as of January 2019). I love the color variation in slide boxes. Color choice reflects the cost of box colors on Amazon over the years.